I told BR that I was going to paint that on a sign to hang on the wall of the coop/pen. He smiled and said: "Well we don't rent pigs and I figure it's better to say it right out front because a man that does like to rent pigs is... he's hard to stop"
I agree with Gus (and BR for that matter) 100%. But need to add "or Chickens". Please tell me you know the movie this came from. PLEASE. I really think this is the best movie of all time. I have seen grown men cry when watching this movie. and I have watched it at least 300 times, and STILL cry. But I laugh too. The pigs seem to be doing great. I did have to worm them, and although I wont get into that, it was discusting. worming them was easy. I just put the wormer on their feed. Picking up the end result was not fun. *shudder* And I have had to do some pretty 'interesting' stuff in my life with animals. But this did take the cake. Oh and they are officially spoilt. They MUCH prefer scraps to their food. So now I just have to get a good steady supply of scraps. they will come up to you now and eat out of our hands. And are always tugging on my shirtails. I havent managed to teach them to sit yet. But I am still trying. The chicks are doing great. the new babies are all still with us, not a problem with them at all. Other than: we are out of moths. Seriously. I reckon my kids have caught and fed them every moth in a 5 mile radius. Remember how Bow was SOOO sick? Well, I got him the antibiotic, but his fever broke right before we got to the DR. I gave him a few days worth of meds and then, like clockwork, he gets a severe red rash after 5 minutes of being outside on Saturday. All that time, money and worry, and it was 5th disease. I KNEW it was. I had already diagnosed Rayley. But he was just running the fever longer, and then with him being so cranky and whiny, I let all common sense fly right out the window and rushed him to the Dr. All for a childhood illness that every kid gets, cant be fixed, cured or even 'helped' and is just more of an annoyance than anything. Friday was my 'big day'. I went to the kids school for the 7:30 coffee with the superentendant, that didnt go so well. Of course, when he walked in and shook hands with everyone he said "Nice to meet you I am Dr. ...... " and then when it came to me it was "Hey Mrs Byerly, glad to see you again, its been awhile"
THEN, he went down the table, welcomed everyone, asked if they were familier with everyone, etc. and he got to me. He said "Its great to see these new faces (there were 4 others there), and of course MRs. Byerly. First of all, lets see if y'all have any questions or concerns, Just speak up. Mrs Byerly knows how this works, if y'all dont know her, she is a very familier face around here, in the PTA, and always willing to let anyone know how she feels about something." The parents brought up differnt things they didnt like going on. Then of course there was the talk of uniforms, he brought up that some folks had left the district because of them. (our district is VERY upset about the lost kids. it means less money and they are trying to get them to come back) and one parent said "maybe the undesirables, we dont need them anyway" and there was the "everyone needs to learn to conform" comment To say I was livid is to put it mildly. Anyway, I was as nice as I could be. and I really didnt throw a fit. I said my peace and left. To head over to the firestation, so we could get a start on the fundraiser. I spoke on the radio, begging people to come out and buy a plate lunch. Unfortunatly, we were only able to sell less than 200 of the 1000 links. I am very disapointed. And it wasnt because of money. The resturants were ALL full. The fast food joints were packed. The fire Dept said they had not seen one this bad. Of course, there was another fundraiser going on too. They were selling their plates for 2.00 more than ours. They didnt do too well either from what I hear. The Sherrifs Dept had put it on. We worked our butts off, from 8am to 3pm (not including all the stuff BEFORE hand) for about 1500.00. We are just so thankful that everything was donated and there was no money to pay for the stuff out of the amount raised. There is no way that BRidge City will be able to do a thing with 1500.00. I just feel so very bad. Even our little piddly newspaper wouldnt help us out with advertisement. Just talking about it depresses me. But once we were done with the fundraiser, I had to pick up the kids at daycare, run home, and run back to town for 5:30 baseball practice. While I was sitting there my phone rang, it was the school. Hoover calling - at 3:18. "mom, can you come get me, or bring me some shoes. My boot fell apart"
"Matt, why did you wear the boots that have the sole coming off? I told you I am taking them back, they are defective!" "well, school is out, just get on the daycare van and come on. I am waiting on you"
"I love you Hoover, hurry up" and I hung up. Okay, if I had been at home, I would NOT have driven in to give him a pair of shoes so he could leave the nurses office to get on the daycare van. SECOND, If I was IN TOWN, I wouldnt drive 20 miles home, and THEN, 20 miles back, after having to wade into the toxic waste dump to find shoes. I seriously am not sure I would survive a trip in there. They showed up and home we went. Of course, the 87 times that I had told the kids to make sure their baseball stuff was clean and ready hadnt been heeded. They couldnt find ANYTHING. I had done up all the laundry, but I cant snap my fingers and make uniforms appear. And I refuse to walk into the toxic dump and find something to wash.
Of course, we had to run to walmart to get cleats. Cause Brett had outgrown his, and although his old ones were the right size, they were 'hurting' Matts feet. 2 new pair of cleats. At least I have 2 pair to donate to the team this year. Practically brand new ones too. Maybe someone can use them. When we finally got to practice, I went to unload the team water. Somehow I became in charge of it. Oh yeah. Cause noone else would do it. I had already filled it up with ice that I stole from the VFD. So I was good to go. Till I got back there. Now, this cooler has ridden in my truck for years. I take it out when season is over. so far this year its been in there 2 weeks. and its never tipped or spilt. BUT today, it did. It was BONE dry. I had to jump back in the truck and run to the store for water and ice. When I get back the kids are split up into groups. Due to new rule this year concerning pitchers and catchers, the coaches want at least 5-6 kids trained for one or the other position. Matt picked pitcher. Now, he does have a good arm. and has gotten amazingly accurate this year. But I dont know if he is pitching material. Brett on the other hand, the one who LOVES to pitch, chose catcher. Which means I have to buy a cup and jock strap. It was also suggested I buy a catchers mitt. Pitching is cheaper. I will get the cup and jockstrap. But he will borrow the team mitt until he gets REAL good. and I dont hear him whine about his knees. EVER. Saturday we had a scrimage at 3 but the boys and BR went out and cleaned up the yard some before we left. And he and I discussed what we needed to do to build a pen for the boar hog. He cant stay in with the sows. We didnt plan to raise them when we designed and built the pen. We just planned to buy a few a year, hold them for 6 months and butcher. But since they are harder to find than a needle in a haystack, we had to change our plans. The boys were able to find their uniforms easier this time. Since I had made them wash them the night before. The kids got to pick where they wanted to play, since our coaches have been working on technique and not putting them in positions yet. Matt played short stop and Brett 3rd base. Brett has never played 3rd base, and honestly, this kid is good at centerfield. I am not one of those "my kids are GREAT at baseball, and you better play them here" or "how dare you not give my kid the position he wants" But, to not put Brett in centerfield is just weird. he is hell on a popup. And has a good arm. He can throw it in from the outfield to the pitchers mound. Matt on the other hand has played shortstop, and isnt awful at it. He can do it, and when he tries he is actually good. One of the first balls hit went right to second base, and then into the outfield. SO Matt ran to be the cutoff man. The batter was rounding second when he got it so he threw it to Brett on 3rd. and they got him out! I was SOOO proud. Now the kid that hit the ball is one of my friends sons. So it was kinda funny. When I talked to her later, she said that her 6 year old daughter got on to her because she was cheering Brett and Matt on when they made the play. It was a perfect catch and an even better throw. I was so proud of Matt. because in the past he was a border line 'why is that kid even out here?' player. I think he might be coming into his own. Brett did well too. He remembered to tag the runner and not just the bag, and was in position - ready to catch it. Not bad for never playing that position. The next inning they switched them. This confused me. But Matt did shock me. They were tossing the ball back and forth, warming up, and 2nd base threw a ball to Matt. He caught it at 3rd. Then threw it to 1st. Hard and without the 1st baseman having to step off the bag. I almost fell off the bucket I was sitting on. Shortly there after we had almost the same play as before. Differnt kid, but another friends son. This time, Brett did get the ball, on the cutoff throw. Matt forgot he was playing 3rd, and didnt cover the bag. But, Brett also could have tagged the runners since they were so close to him. Then, the last play of the night was a pop up to second, hit by the kid BRett and Matt had worked together to get out. Brett was still SS and ran over, snagged it right out of the air and ran around the base with his arms up. While the kid on third tagged up and scored from 3rd. It was a GREAT catch. BUT he forgot there was a runner. Since it was only the second out they were awarded the point. When my friend called me later that night she did tell me that her son was mad cause both of his at-bats resulted in him getting out. I laughed and told her "what do you expect when you have a powerhouse like the Byerly Boys out there?" She of course knew I was kidding. Once the scrimage was over we went ahead and practiced. BR helped with Batting, and he really enjoyed it. He would do good as a coach, but says he doesnt want to deal with the parents. Our coach told him "I think Michelle can handle the parents" They really dont know me. OR BR. our philosophy is: If all you want to do is gripe about how its being done, pack up and leave. Thanks for the donation to Little League. Kind of a "dont let the door knob hit ya where the Good Lord split ya" type of attitude. I did run the dugout. I dont think I can really do this during games. These kids are going to have to get used to some rules. I swear, they are like drunk monkeys in there. Which reminds me, I am going to have to do a lineup poster. I have done one the last few years. Its the best idea I have ever seen. you write all the kids names on peices of posterboard, then put velcro on them. Then you get a half sheet of posterboard and put velcro there. you can change it when the lineup changes, but you have it in front of you. Hanging on the fence with carabiners. Its been a lifesaver more than once!! OH and thats one of my rules. those bat bags come with a hook for a reason. to hang on a fence. There are boxes for your helmet and your gloves and a PVC pipe with cut outs for the bats. NOTHING gets thrown on the ground. PERIOD. I told the kids this about 5 times. then, when we were done, and the kids were gathering balls on the field, I found a helmet right in the way. I flipped it over, and it had a number 6 on it. Since my kids are lazy, they had been sharing a helmet. Brett had worn it last. So, I picked it up, walked to the fence 200 feet out and dropped it. Then told Brett to go and get it. He thought I was picking. he did go and get it. and on my way back, I noticed that about 4 kids picked up gloves they had just thrown down. If their momma's dont like the way I run a dugout, they can get out of the stands and run it themselves. I also have a rule about cups. Not because I dont want to have to continue to buy cups, BUT I dont want a bunch of trash everywhere. I give you a cup. your name is in it. Dont break it, dont throw it down, dont loose it. If you do, you get one more cup. a pink one. After that, your mom can supply your cups if she wants you to drink. There are 12 kids on a team. plus the catchers gear and various other peices of random equiptment. The person in charge of the dugout should not spend all their time keeping up with it all. They deserve to watch the game too. They are am in charge of getting the kids on the field, making sure shoes are tied, caps are on, (or helmets if they are batting) keeping them from fighting, getting them out in the right order, gloves are on, that noone leaves the dugout before they are batting, that noone is getting hit with a bat they snuck in the dugout. This year I might keep the books and keep up with the pitch count. You cant worry about someone tripping over a helmet and breaking a leg. or getting beaned upside the head with a bat. I have done the books before. Its easy but at the same time hard. I am scared that I will screw it up. It actually matters in this league. We all know that I am ditzy. Anyway, we practiced till 7:30. Then came home. where I told Brett I wanted to see his helmet and bat bag. They have been using Matts. They looked for a few minutes and like most of their missing stuff (like the belt last week) it had grown legs and walked off. I made them a deal. If I walked in and found the helmet, or bag or both, they had to promise to clean their room. BOTH jumped at the chance for ME to search. and let them off the hook. 5 minutes later I stepped on the helmet. At that point I declared myself the winner and told them to go to bed. B. I could care less if he has a fancy bat bag. you aint gotta have it. You can tote a glove, bat and helmet. They still have some more to clean in there, and Rayley did very little of hers. She thinks she can ignore me and I will ignore it. But she is in for a rude awakening. 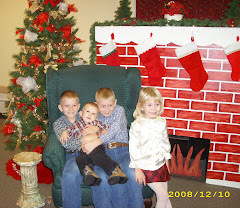 They didnt get to shoot their guns, their bows or practice baseball with their dad any. ALL day. I didnt get to put in the waterline, get more of the yard cleaned up, or finish any of the other outdoor chores. And their dad told them if they dont finish it tonight, there will be no baseball practice on Tuesday. And I am one of those moms that feels if you dont go to practice you dont play. Now we are not playing right now, but, if/when we start, I hold them to that. And he threw together the cornbread while I was rolling out the dumplings. Both the meals we made yesterday will cost me less than 10 dollars this time next year. Just the staples. Everything else will be grown or butchered here. Picked or raised by us. The thought of this THRILLS me. AND we will eat on that pot of dumplings for 2 more days. at least. with some of it going in the freezer for a small meal later. Breakfast of course was gone in 20 minutes. Every last crumb. There is very little that I love more than bacon and eggs. Now, I fiqured out that my camera will take a video. There is nothing cute or video worthy going on. BUT, I decided to test it out. Not sure if this will work or not. Here is Rayley. Supposed to be cleaning her room. I dont know if you can hear her or not. of course, she was abnormally quiet while I had the camera out. And she didnt even know I was taking a video. She thought I was waiting to take a picture. I did a 20 minute one, but there is no way it would load. so, then I tried two that I took after the long one. From about 9:30 till well after 5 I tried. So now I give up. Maybe I will fiqure it out. Or maybe you cant do it on dial up... ?? I dont know.